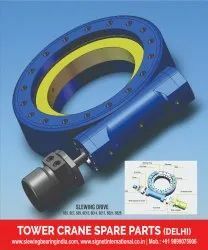 Offering you a complete choice of products which include slewing drive and potain tower crane slewing bearing. Owing to our years of industry experience and precise knowledge of this domain, we are offering an outstanding assortment of Slewing Drive. By adopting slewing bearing as its core component, slewing drive can bear axial force, radial force and tilting moment simultaneously. 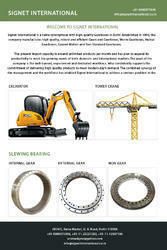 Slewing drive is widely applied in modular trailers, all types of cranes, aerial working platform, solar tracking systems and wind power systems. Electric and planetary gearboxes can be designed according to customer's requirement. Slewing drive has the advantage of saving space in facilities, max load capacity in a compact design, extensive lifespan, reduced maintenance costs, etc.